Unfiled Cut Crafted from premium cane for consistent response and playability, La Voz is the choice of professional saxophone and clarinet players. 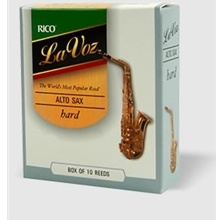 Unfiled for a deep, powerful tone, La Voz is the reed of choice for many of the world's top musicians. Available for saxophone and clarinet in boxes of ten reeds. Unfiled reed for powerful tone. Premium cane for consistent response. Available for clarinets and saxophones. Available in strengths Soft to Hard.